The Syrian government on Friday condemned U.S. President Donald Trump’s pledge to recognize Israel’s annexation of the Golan Heights, saying it flies in the face of international law. Syria was joined by other countries, including Turkey, Russia and Germany, in condemning the move. Trump’s abrupt tweet broke with U.N. Security Council resolutions and with more than half a century of U.S. foreign policy treating the Golan as occupied territory whose future would be negotiated in talks with Syria on a comprehensive peace. The return of the territory has always been a key Syrian national demand, championed by government and rebels alike through the bloody civil war that has torn the country apart since 2011. The Syrian government said Trump’s comments flagrantly disregarded international law. “The statements of the U.S. president and his administration on the occupied Syrian Golan will never change the fact that the Golan was and will remain Arab and Syrian,” the source said. Syria’s main opposition grouping too condemned Trump’s comments and said it remained committed to the Golan’s full return. Turkey, which hosted the last indirect peace talks between Israel and the Syrian government in 2008, said the abrupt policy change from Washington risked plunging the region into a “new crisis”. “Trump’s unfortunate statement about the Golan Heights brings the region to the edge of a new crisis,” President Recep Tayyip Erdogan said. Turkey was a key supporter of rebels battling to topple President Bashar-al-Assad, but in the past couple of years has worked with his main backers Russian and Iran to bring the conflict to an end. Germany, another NATO ally of the U.S., also criticized Trump’s move in a tweet from its foreign ministry’s account. “We have taken note of U.S. President Trump’s Tweet on the Syrian Golan Heights occupied by Israel. The position of Germany and the E.U. on the Golan Heights is unchanged and in line with relevant U.N. Security Council resolutions,” the tweet said. Russia warned that the policy U-turn called for by Trump’s could fan the flames of new conflict in the region. “Certainly, such appeals can considerably destabilize an already tense situation in the Middle East,” Kremlin spokesman Dmitry Peskov said. “It’s just a call for now, hopefully it will remain a call,” Peskov told reporters. “After 52 years it is time for the United States to fully recognize Israel’s Sovereignty over the Golan Heights,” he said. Following a long period of calm along the armistice line on the Golan after the Arab-Israeli conflict of 1973, tensions flared with the eruption of civil war in Syria in 2011. It also launched a bombing campaign against suspected positions of Iran and its Lebanese ally Hezbollah, which have both intervened militarily in support of Assad. Since the Syrian government decisively defeated rebel fighters near the armistice line last year with Iranian and Hezbollah support, Israel has vowed repeatedly to prevent its arch enemies from establishing a long-term military presence. 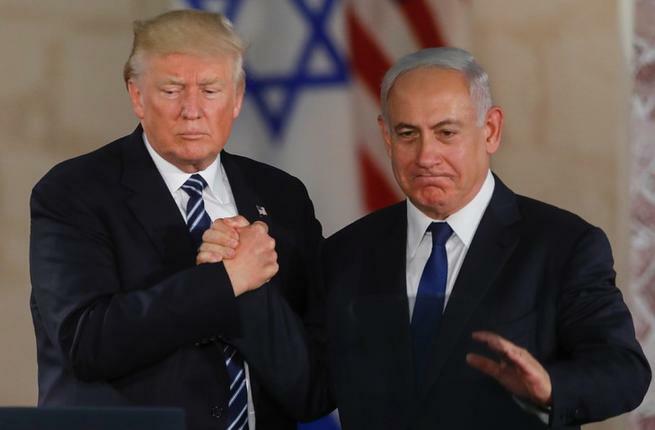 Trump’s recognition announcement was swiftly welcomed by Israeli Prime Minister Benjamin Netanyahu. The Golan recognition is only the latest diplomatic bombshell dropped by Trump in seeking to redraw the fraught Middle East map on Israel’s favor. A U.N. probe released last month said Israel may have committed crimes against humanity in responding to last year’s unrest in Gaza, as snipers “intentionally” shot civilians including children, journalists and the disabled.